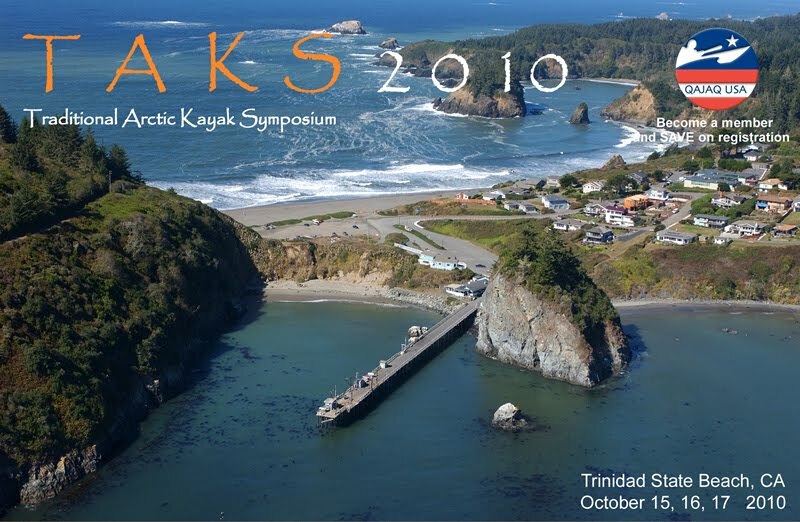 Last weekend, we journeyed off the Mendocino Coast with our sea kayaks and greenland paddles and headed to Trinidad, California for the Traditional Arctic Kayak Symposium (TAKS). 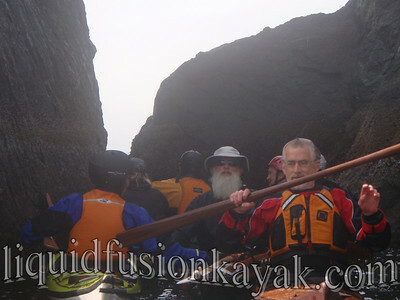 Beautiful weather, calm wind and ocean conditions, and an eclectic gathering of sea kayakers interested in traditional kayaking made for a fun weekend. 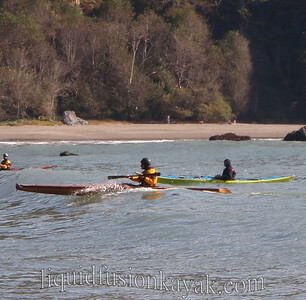 The ocean was very calm and allowed for mellow paddling around and between the rocks of Trinidad Bay. We fit 9 kayaks in this particular slot. Bob in his beautiful stitch and glue wooden kayak was very happy to have my plastic Avocet as a buffer between his boat and the rocks. 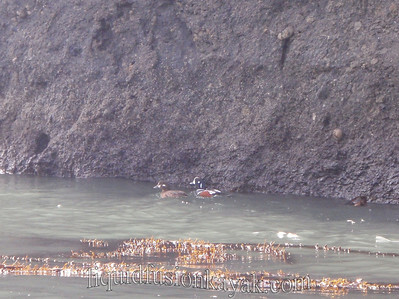 A pair of harlequin ducks added to the color of the weekend. John Peterson of Shaman Kayaks organized the event. 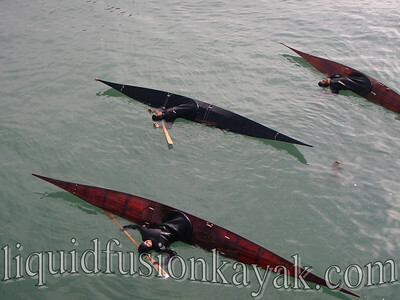 His kayaks are truely works of art. It was fun to see several of them on the water this weekend. Greenland skill demonstrations included rolling and bracing. Jeff and I thought that the resting brace position looked great for an on water nap. 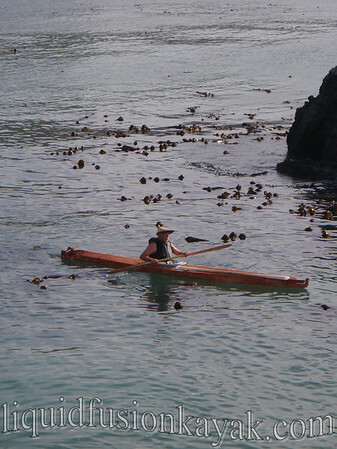 Wolfgang Brinck paddles over in an Aleutian Kayak sporting an Aleutian hat. 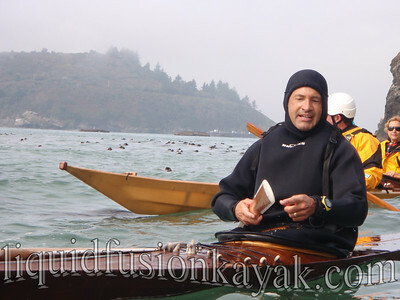 Wolfgang is the author of The Aleutian Kayak and teaches skin on frame kayak building in the San Franscisco Bay area. Despite the roll or drown motto of paddlers dedicated to greenland paddling techniques, Dan and Andrew demonstrate a rescue and recovery of a swamped boat. 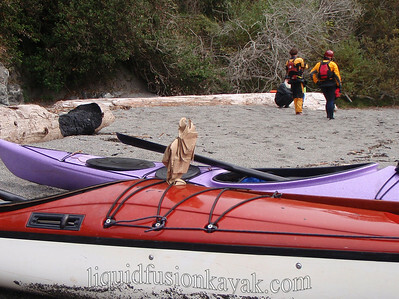 Our friend John Henry observes the lunch break from the deck of Jeff's kayak before going back into his drybag. 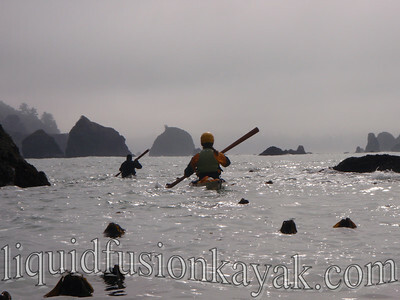 We paddled around Trinidad Head - home of the Smack Wall. We paused for a couple of rides on the refractive waves that come off of the Smack Wall. Here's a link to Ralph Johnson's video of Tony's wild ride on the Smack Wall. Cheri Perry and Turner of Kayak Ways and Jeff of Liquid Fusion Kayaking held a surf zone training and practice session at college beach. 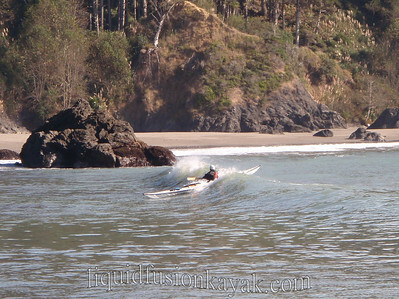 Here is Marcella of the local kayak club Explore North Coast catching a wave. Admiring the handmade kayaks and listening to presentations on the history of kayaking and kayak designs provided much food for thought over the weekend. 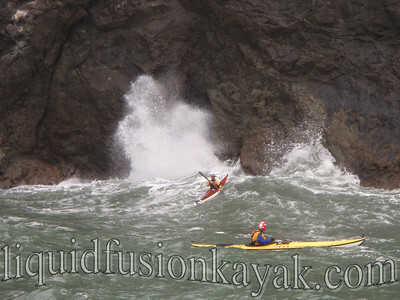 Here is a photo of Andrew paddling a baidarka into the surf zone. 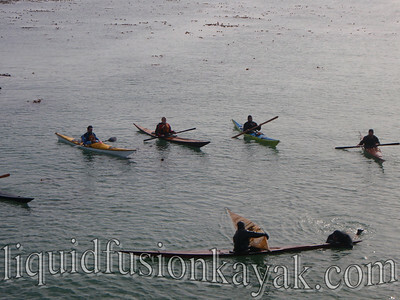 Much debate ensued over the weekend of the unique bow design of the Aleutian kayaks. Any ideas? I left my skin on frame kayak at home. It would have been fun to have in the surf zone and rock garden and definitely would have been an object of curiosity and critique as it is not a long pointy greenland kayak.